A trio of Golden State Warriors starters were hit with fines by the NBA on Tuesday. Stephen Curry, Kevin Durant, and Draymond Green were all fined for criticizing the league's officials following the team's 131-130 loss to the Timberwolves in Minnesota last Friday night. Green was fined the most at $35,000, despite the fact that his apparent infraction came via a pair of cryptic messages on Twitter, while Curry's fine was $25,000, and Durant's was the least at $15,000 following the public comments made by the two after their loss in Minnesota. "Golden State Warriors forward Draymond Green has been fined $35,000 for making statements on social media which impugned the integrity of NBA officiating; Warriors guard Stephen Curry has been fined $25,000 for his actions and public statements impugning the integrity of NBA officiating; and Warriors forward Kevin Durant has been fined $15,000 for public criticism of the officiating, it was announced Tuesday by Kiki VanDeWeghe, Executive Vice President, Basketball Operations. The NBA's investigation into this matter included the review of player conduct that took place through Sunday, March 31, and the ultimate findings were determined after verifying all available information. 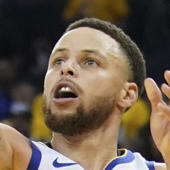 The actions of all three players occurred at various points during and following the Warriors' 131-130 overtime loss to the Minnesota Timberwolves on March 29 at Target Center." It's rare that you see three players on the same team all get fined for criticizing the refs at the same time, but the Warriors clearly felt very strongly about the way that their loss to the Wolves was officiated. We'll find out soon enough whether or not these fines change the way the Warriors' three stars interact with the officials when they take the floor on Tuesday night for their highly-anticipated matchup with the Denver Nuggets (10:30 p.m. ET -- Watch on FuboTV with NBA League Pass add-on). Should the Warriors come out on top this evening, they will all but assure themselves of securing the top seed in the Western Conference playoffs while a victory by the Nuggets could make things much more interesting over the course of their remaining regular season schedules.